After running into loss to the tune of Nu 28M last year, Dungsam polymers made its first profit at Nu 3.8M in the first quarter this year. The profit was attributed to several cost-cutting measures and marginal increase in terms of sale of cement bags to Dungsam cement. The company, a subsidiary of DHI suffered loss last year with the Dungsam cement factory yet to optimise production. Dungsam cement is Dungsam Polymers major market for cement bags. In the first quarter last year, Dungsam Polymers produced 1.45 million number of cement bags out of which Dungsam cement took 0.33M number of bags. In the same period this year, it produced 7.8 million number of bags out of which Dungsam cement took, 2.25M. 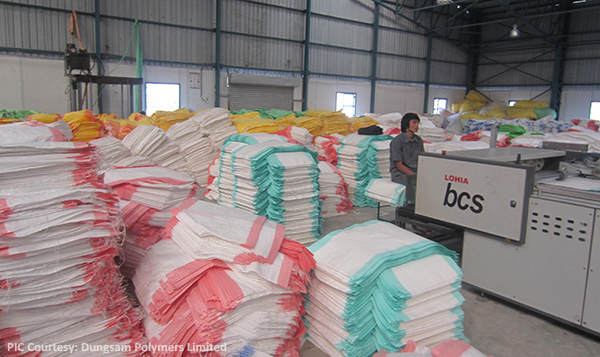 The Chief Executive of Dungsam Polymers Norbu Tshering said after the company made a loss last year, several cost cutting measures were put in place. The company suspended board siting fees, shift allowances, overtime allowances and position specific allowances, he said. It was all done to improve the financial position of the company. Today the company has been able to utilise around 50 percent of its total capacity. Last year it managed only 30 percent. Its peak production has also reached 70 percent. At this rate, the company would be making profit this year, he added. It will be able to pay taxes to the government. However, when it came to declaring dividends to its shareholders, it will be decided in its general meeting. The Druk Holding and Investments owns 51 percent of the company while the public holds 49 percent. It was unable to declare dividends last year as it entered into loss. When it started operation, the company floated its shares at a premium value of Nu 160 a share.